#GivingTuesday is a good day to answer the question, “What Do We Do?” After all, no one wants to donate time or money to a cause they don’t understand on #GivingTuesday or any other day. First and most important, we save lives. We save dogs and cats from the shelter and we get them home to their family. We reduce the burden on the local shelter by keeping pets with their families. We save senior and special needs cats that need rehab, special homes, are unadoptable, or in pawspice care. That’s the simple story. Catnip Casa Cat Refuge is the parent organization. We started with senior and special needs cats as our focus and they are still a very important part of our work. Through our work with the kitties, we discovered a gap in services that left many animals and their persons in a terrible position. Pets are losing their homes when the owner goes to the hospital. Some owners are disadvantaged (seniors, veterans, disabled). Often, through no fault of their own, they have no family to offer care and no resources to pay for care for pets when they become ill. That usually means giving up a pet or pets–permanently. Why send a pet that has a loving home to a shelter that’s already overcrowded? Why put the pet and the owner through the grief and loss? Why take away an animal that may be a senior’s only companion? Why isn’t there a program that will keep these pets safe and send them home? Why put one more pet into a shelter for over-worked rescue organizations to pull and rehome? Why jeopardize the life of an older animal that may not be adoptable or may become ill from the stress of a shelter environment? There is an answer. Respite care foster homes–a program that offers short-term (respite) foster homes until the owner recovers enough to go home. That’s why we started Love & Cuddles Pet Respite Care program. Some pets live 15-20 years or more. The present circumstances may not have existed when the owner got their pet, but they don’t quit loving them when things change. In fact, pet owners frequently avoid getting needed medical care to protect their pets and avoid giving them up. In cases where the pet is given up, owners sometimes come home and decline due to guilt and depression. That’s why we say, Save A Pet–Save A Family. Our program is a win-win for people and pets. We partner with community service programs, like the Meals on Wheels PALS program, to serve the most needy pet owners. We always need money for emergency boarding and vet care, as well as foster homes. Donations are critical on #GivingTuesday and all year. The Love & Cuddles Pet Respite Care program needs food, medicine, veterinary care, and supplies for the animals we take in. 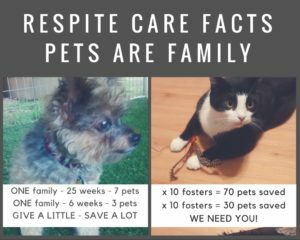 We don’t want to place a burden on our foster families to pay for the care of animals they foster. They already give their time and their home to needy animals. When pet owners have health problems and limited resources, they need us to pay for food, medical care, medications, and supplies for the pets until they get well. We recently received two kitties in a covered laundry basket! Obviously, they need carriers for safe transport home and for normal vet care trips. Of course, the Catnip Casa Cat Refuge kitties also need all of those things all year long. In addition, we accept donations of food, litter, pet carriers, and toys too. We’ll even pick them up if you are in Austin, Texas. Also, check out our How to Help and Shop & Save pages for easy ways to shop, save money, and help the animals. We’ve worked hard to get where we are today. #GivingTuesday is the perfect time to thank you for being a part of our family.